There was just about 3 months of time between my beginning and current pictures. 3 months ago I was weighing in around 195 lb and I would guess roughly 12-13% body fat. I had slightly visible abs but only if the angle and light were perfect. I am currently weighing in at 180 lb and I would estimate to be around 8% body fat. I was on a cut for roughly two and a half of the three months and then switched over to maintenance which I am currently still doing. While cutting, I was still making progress in the gym on the big four: squat, bench, deadlift and military press. I was switching from the mindset of lower weight/higher rep training and my body has responded well to working in the 4 – 6 rep range. I tracked all of my weight/reps in the gym and it has definitely helped me see how my numbers have increased from when I first started. I previously would work out at least 6 days a week (most often 7) exhausting myself completely and would spend easily over an hour in the gym most days. I am now following the 5-day split and am usually in and out of the gym in an hour, even while working out with a partner. I had mostly read online message boards (reddit, bodybuilding.com, etc…) prior to picking up Bigger Leaner Stronger. I always tended to drift more to what sounded like the ‘one secret to XYZ’ type articles or seeking out information that would go along with my current mindset. It would give myself the reassurance that if I just kept doing what I’m already doing, I’ll be where I want to be in no time. When I saw Bigger Leaner Stronger I was hesitant because the reviews and the ideas from the book I gathered prior to buying it were the opposite of what I was currently doing at the time: heavy weight/low reps, track your food, etc… so I delayed the purchase until I knew that I just had to try something new. By far the thing I like the most about the program is how science-based it is. Everything in Mike’s book is extremely well researched yet very easy to read. The program was much simpler than anything I had followed before (previously I was very heavy into the drop sets and giant sets, with a minute or less between sets) and while I was hesitant at first, seeing the quicker than expected results made me a true believer. Like most people who start following this program (I’m betting), I was initially hesitant to believe that I’d see great results with the type of training laid out in the book. I thought I had to be doing drop sets, constantly switching up my routine to “confuse the muscles,” or focusing on hypertrophy type workouts so that I can build muscle while also cutting fat (even though I was way past my ‘newbie gains’ timeframe). I was similarly nervous about tracking my food and thought that it would be extremely time consuming. After about a week it almost felt like second nature. I had always been good about meal prepping, so that made it easier than going into it cold, but I was surprised at how easy tracking my food is. My fiance and I are both tracking our food, so having that support system and partner made it that much easier. One person cooks while the other tracks everything for both people. Growing up I was always the super skinny kid; I weighed 160 lb and was 6’2 when I graduated college. 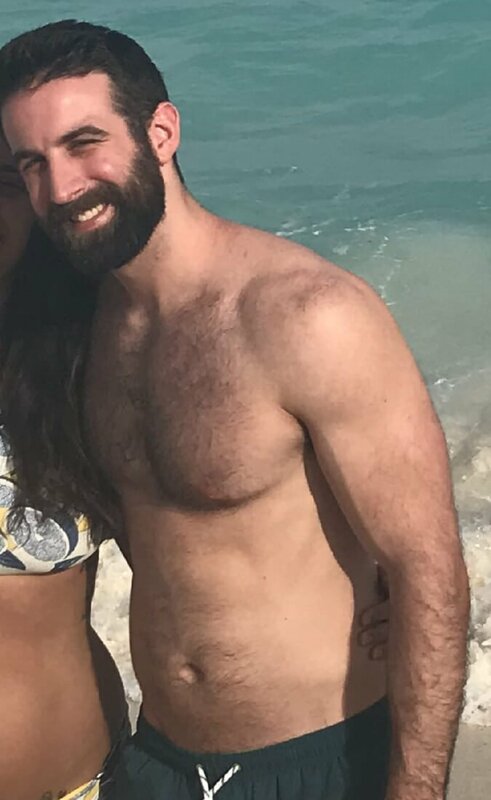 I started to take working out seriously after graduation and started a ‘bulk’ that was mostly me eating more food and relying on newbie gains. Due to my high metabolism, I was able to keep a relatively flat stomach despite my lack of attention to my diet other than knowing I should eat a lot of chicken and rice. Ever since starting this diet and workout plan, however, I have gained a lot more confidence in my body. I used to dread taking my shirt off when I was in high school and college since I was so skinny. I gained a little more confidence after I started working out–but nothing close to how I feel now. I am now excited for the beach and the pool–the gain in confidence has been one of my favorite benefits of the program. I have recommended both the meal plan guidance as well as the workout program that is laid out in Bigger Leaner Stronger to anyone who asks about working out. I hear many people talk about the different fad diet they’re following, what fat burner they’re taking now, and I see folks at the gym skipping the big four lifts and focusing on low weight/high reps and doing hundreds of sit-ups a day. Whenever these people ask about how to get into better shape I always point them in the direction of Bigger Leaner Stronger. For those folks who have stumbled on to this page and are looking at the transformation pictures trying to decide if this is the right program for you, go for it. This program isn’t going to give you that one secret workout to make you instantly have abs, and it isn’t going to give you a super easy program to follow. You’re going to have to put in the work laid out in the book and follow the diet advice. At the end of the day, if you follow exactly what Mike says (not the latest bro-science laid out by the magazines and whichever IG fitness model you’re looking at that day trying to sell you supplements you don’t need) you are going to see results. I don’t take many supplements, but I do use Legion Pulse. The kick given by the pre-workout is great (just read the reviews on Amazon) and feels clean–no jitters and I’m not up all night after working out (I workout around 4 pm).